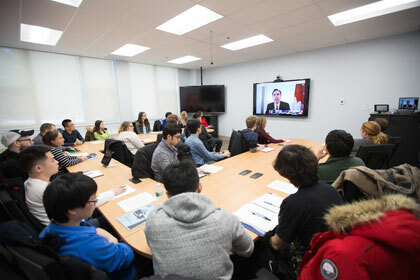 Approximately15 University of New Brunswick fourth-year economics students took part in a Google Hangout with federal Finance Minister Bill Morneau yesterday to discuss their priorities in this year’s upcoming federal budget. UNB was among eight universities across the country to participate in the Google Hangout where several university students posed questions to Minister Morneau about issues concerning them. “As a father of four, I can say with two kids in high school and two in university, I know how important it is to listen to your challenges. And more importantly, I think I have some context to understand the tremendous insight that you bring to the table,” Minister Morneau added. UNB’s Vice President Academic (Fredericton) Jane Fritz says this was a wonderful opportunity for students and appreciates that the minister’s office decided to kick-off their consultation sessions this way. We welcome your feedback for the 2016 Budget. Also, you can post comments and questions on the Facebook page. The Minister will answer some of those questions during two Facebook Live events next week, Monday afternoon at Dalhousie University, and Friday afternoon at the University of Calgary.